BA bits: LA and San Jose 787 cancellations, good US Winter Club World fares, are YOU called Harry or Meg(h)an? The curse of the Boeing 787-9 is now starting to bite at British Airways. The ‘coming and going’ heavily discounted Club World fares to the US are back for anyone who can commit to travelling in 6+ months time. ….. so, nothing before mid November. You can only travel outbound mid-week (Tuesday, Wednesday or Thursday) and inbound Monday, Tuesday and Wednesday. I would strongly recommend also pricing up the flights on the BA Holidays website here. Adding a car or a hotel may not cost much more and could even end up being less! You also get the benefit of only having to pay a ‘from £150’ deposit now to secure your trip. Where American Airlines flies the route, you can pick AA instead of BA for the same price. You should check the exact configuration of the aircraft type shown but it is likely to be a better seat than Club World, especially if travelling alone. Are YOU called Harry or Meg(h)an and flying this weekend? If you are, but you’re not flying, and want to check out BA’s Galleries First lounge you may want to book yourself a quick weekend break. Or perhaps just a quick there and back to Manchester! 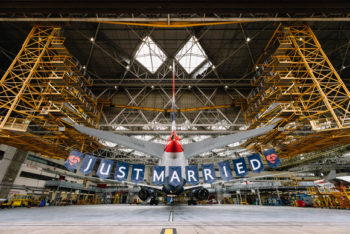 Any British Airways passenger flying out of Terminal 5 this Saturday, the day of the wedding, who is called Harry, Meghan or Megan, will be allowed to use the First Wing private security channel and the Galleries First lounge. This offer applies to everyone travelling with Harry or Meg(h)an too. That is the good bit. Here is the silly bit. BA93 (13.10) to Toronto on Saturday will have a 100% Harry or Meg(h)an crew. Oh yes. Given that these are not hugely common names I can imagine it was tricky to get that many rostered given the strict rules on flying hours and gaps between flights. There is some upside for passengers on this flight though. Every passenger will get a personal bottle of Castelnau Blanc du Blanc champagne and an individual celebratory wedding cake. 30,000 Membership Rewards points (=30,000 Avios) for getting Amex Platinum .... but is it worth £450? Is anyone experiencing delays in getting AMEX to approve new cards ? My wife applied for a new gold credit card about 15 days and got the “we can’t make an immediate decision” response. We haven’t heard anything yet. I could get her to call but, as with many of us on here, I try to keep my other half away from our credit card “fun”. Anyone else had issues ? Yes, with Amex Australia, doubt there’s any link, but there could be some new bureaucratic process that’s been implemented Amex-wide? It was an application by OH (well, it was in her name), I eventually had to inform her she needed to call up about her application, which she did. Turns out they needed to confirm the details of the supplementary cardholder (me)! Why they couldn’t have told us about that in an email, or even a phone call, I don’t know. My advice, if they haven’t contacted you within 5-10 days, give them a bell. Got an instant approval on Monday for my OH but also a note to say ‘We have received your Supplementary Card(s) application and have one more thing on our end to finalise before we can say yes!’ – so waiting on that, for whatever reason. I got the same message when I applied for an SPG amex just days before I travelled to Toronto. Got back from Toronto on Monday and a shiny new card was waiting for me along with 18k MR credited to my plat card. Yes, very slow, around 3 weeks from application to getting the card for me. Do you mean San Jose California or San Jose Costa Rica? I’m guessing the former but just want to check. Although not too worried at this stage as our trip isn’t booked until November (to SJO). Got word from where? MBNA? That’s a shame (albeit an expected one), I’ll need a new way to keep my AA miles alive, which is difficult enough from Australia as it is. If you have a VPN with a US server you can connect to you can buy any TV episode or film from FandangoNow through the aadvantage eshopping portal to stop miles from expiring. Should cost less than $2. I do indeed think that would be a good idea! Don’t know about AA miles, but hotels.com avios don’t get added until after your stay. Has anyone obtained such a refund before and had it put through to a different card than the one that was used for payment? Where would hotels.com refund the payment made with AA credit card if you no longer have the card? Absolutely no idea. Not heard a word, either on the grapevine or officially. OT Any word on whether the MBNA M&M card will be closed in the foreseeable future? I received replacement cards last week with an expiry date of June 2021… No letter for me as yet. We’ve seen that before (eg bmi cards) – expiry date on card doesn’t mean anything I’m afraid. Update by 15th June but is 28th July before it comes to an end. East Coast line brought back under public control… only for the third time…. If only that tax avoider Branson could me made to pay a bit more for socialising his losses…. Hopefully the 168 day rule will be upped to 275+ sooner rather than later. (Although I do appreciate this is 90% Stagecoach and only 10% Branson. But his grubby fingers are all over it. OT – I realise this is a matter of personal choice and how much one values their avios… but I’d like to get your thoughts on this. Would you consider this a good deal or I should like at paying no more than 0.8p per point? One more question – is it possible to book flights using avios for someone who’s not in my household account? Just found the answer to my own question: No. Unless they are added to your Friends and Family list (which I did not know was possible – now I do – with Household accounts). It depends how many avios you have and whether you have an imminent future need for them. I wouldn’t buy at that price personally. And if you have a BAEC HHA, add the person to your friends and family list. Just found out about the friends and family list. Sorted. Another thing to factor in is the cash price of the flight. It’s a last minute flight for my folks on Sunday due to an emergency. Cash prices start at EUR 334 with just hand luggage on a decent time of the day. I’m not making them take the 7am flight. There was only availability in Club Europe. It’s a B767 and I got so excited because I confused it with the B777 with lie-flat beds and thought it’d be a nice surprise. At least they’ll get to enjoy the Neptuno MAD T4S lounge plus priority queues when checking in, going through security and boarding. OT just returned to LHR from HND on BA8 today, and got to experience the First bus from a remote stand. All was going well until an unfortunate fellow F passenger (who I suspect might have also been a redemption passenger and who had (also) taken full advantage of the LPGS) somersaulted down the steps, delaying the disembarkation of J pax by a previous few minutes! Will be on BA8 in F in a few weeks (taking father for his birthday), how was the service? Great really, food was delicious and drinks free flowing. Better though on BA5 to NRT a few weeks ago though, helped by the smaller 789 cabin and overnight though I suspect. OT if I may, If I checked out of a hotel and returned a couple of days later, without staying at another hotel in the same chain (Marriott) would that be classed as two stays or one for bonus points? Thanks in advance. Two stays. It is only an issue if you return the next night to the same hotel. e.g. I looked at LHR-JFK out on 3rd Jan 2019 back on the 9th and the matrix was showing the sale fare of a combined £1352 – and neither of those was listed in the dates Rob posted above so it pays to have a play with your dates. It’s also feeding through to ex-INV – where the additional saving is just the APD. EDI and NCL were marginal only £16 saving on the ex-LHR fare but handy for TP collectors and regional flyers. O/T, not sure if this is old news, but I notice Virgin are adding a second daily service to JNB from October. Obviously still works better for them than restoring CPT route. I wonder if we might see more favourable cash prices emerge. OT: MBNA sent me a letter advising that the relationship between them and AA is coming to an end on 28 July. I have the AmEx/Visa duo. You can pay as little as £150 per booking for holidays between £300 – £1500, and £300 per booking for holidays between £1501-£2999. Gaming the system? I don’t think so. Nobody here breaking any rules, simply taking up offers made available to the general public. Or you think I shouldn’t take the second item in the BOGOF offer because that’s theft? The above was a reply to a post which has since quite rightly disappeared. Being now irrelevant, feel free to delete. Harry, that is one of the funniest comments I’ve ever read from you. Obviously not what I was expecting but glad you are OK. I’ve had some experiences due to drinking copious amounts of alcohol but you’ve now done it for me. What a classic….. Glad you’re back and in great form. Get well soon TRH1 – quite an ordeal!